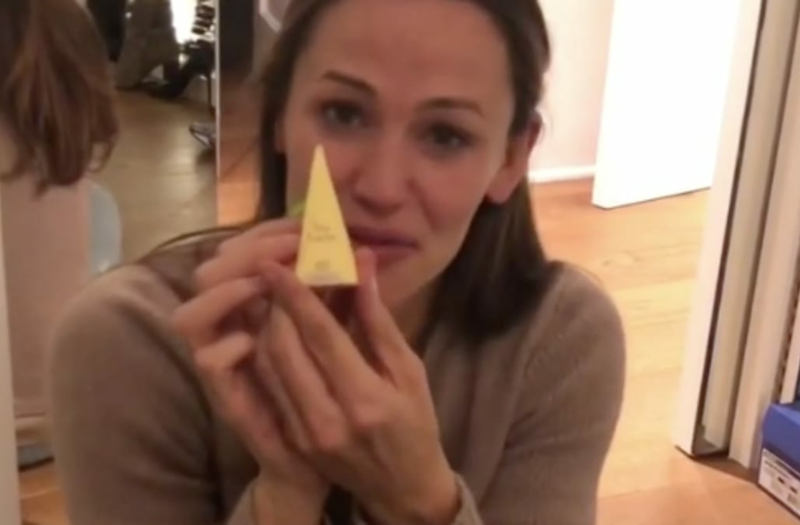 Jennifer Garner has proved yet again that she’s one of Hollywood’s most relatable stars. The West Virginia native, who still embraces her marching-band roots, is back to work on the set of her new TV show, Camping, but it was after a fun evening drinking wine that she decided to invite her fans on social media to take a look inside her purse. The findings were kind of amazing because we’re just like: What? Huh? OMG. But at the same time, who doesn’t have a lot of weird crap in their purse? In that sense, we totally get it. A honey dipper — or, as she called, it “a honey thing.” We’re not sure why anyone would carry one in their bag, but she takes her gardening seriously, so there could be a good reason. A geode — ya know, a rock with crystals in it? “Why, though?” she asked as she held it up, but answered for herself, “I don’t know.” Perhaps it gives off good juju in her post-Ben Affleck life? And finally, a faux light switch, which she demonstrated with a laugh. It’s definitely not an essential … for anyone. So why do we suddenly want one? Garner ended the silly bit by saying, “That concludes today’s episode of ‘What’s in My Bag’”— meaning she now has not one, but two fake online shows. The other, of course, is her pretend cooking show, which is equally adorable — though she seems more sober. She takes her cooking seriously. The actress is back at work on her first big TV project since her Alias days. HBO’s Camping is helmed by Lena Dunham, so maybe the light-switch flashlight will come in handy on the set. We’re not sure anything else in her bag really will.